1. Samuel Mounc of Nutgrove, otherwise Drumreagh, parish of Killinchy, (County Down) died about 1814, the year his will was probated. While listed as such in the index of wills, the will itself probably burned in Dublin in 1922. By a deed of 1 January 1828, Jane Munce, spinster, sold the Drumreagh property of Samuel Munce. Mentioned is James, son of Samuel Jr, , and John Lowry, son of David. Possibly these were the heirs of Samuel. 2. Robert Munce emigrated to Australia on the Garrow, arriving in Sydney 2 March, 1839. 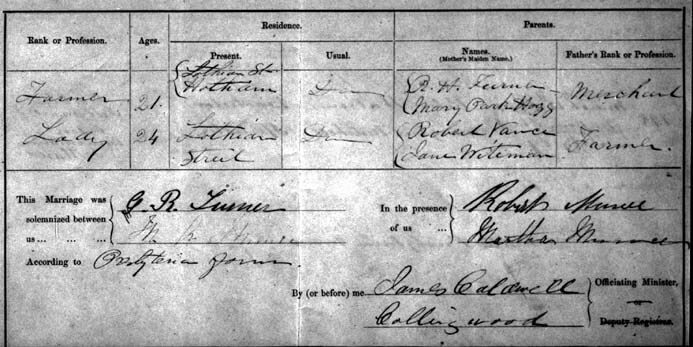 The immigration documents show that he was brought out by the government, a native of Down, parish of Kelencher (Killinchy), son of Samuel Munce, a farmer, and Jane Munce his wife of the same place. He gave his trade as turner and farmer, his age as 32. It was certified that he was in good health, was Presbyterian, and could read and write - there were no complaints. He was accompanied by Letitia Willis, aged 30, daughter of Samuel Willis and Jane Clark of County Down and his daughters Eliza Jane, 8, Mary Anne, 6, and Martha, 5. Margaret, 4, died Jan 5, 1839 on the voyage. Also on the boat was his single sister, Eliza, aged 29 and a Mary Munce, daughter of John Munce. Robert Munce, according to his death certificate, spent one year in New South Wales, 18 years in Tasmania, and 18 years in Victoria. His daughter, Susannah Letitia, the only known child with his second wife, was born in Tasmania 3 December, 1839, so they must have gone there quite soon after their arrival in Sydney. Shipping records show that Robert Munce arrived in Melbourne from Launceston, Tasmania on the Black Swan, January 24, 1859. He was then present at the wedding of his daughter, Mary Anne, to Charles Robert Turner on January 30, 1861 in Melbourne. Directories show him living in Lothian St, Hotham (along with Wm R Munce) from 1860 to 1862. He settled in Warranook, Stawellshire, Victoria where he died 19 September, 1876. His daughter Eliza Jane married Robert Henry McKee in Hobart in 1855 and settled in SW Victoria. 3. Mary Anne Munce was born in Belfast, County Antrim, according to her marriage and death certificates, about 1833, being 6 on arrival in Sydney in 1839. She was 18 then when she married in 1861, not 24 as stated on the marriage certificate. Her further life is described on the Turner page.